The modelling room is a tip. I don't know about anyone else but I can be quite untidy in my own home; and my hobby room is no exception. At 0430 this morning when getting up for work I staggered into said room, looked around and then shook my head. The desk is bad enough, but in the far corner next to my snakes their had formed a mountain of polystyrene. To some it may not seem much, to me it's massive and very daunting.. Haha. When at work I have to walk around and secure the loading bay (security officer... yay!) of the shopping centre. Dotted around are cardboard skips, unfortunately for the cleaners it's not just cardboard that is thrown in, but a mass amount of polystyrene from the shops. I can't control myself and dive in. 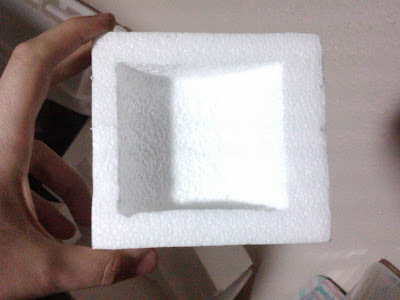 "Ooooh, molten pit for nurgle bath/pool" I say. The problem with this is I gather a certain amount up to take home, once at home it's dumped in the corner for " future projects" I convince myself. Normally I such a convincing argument wouldn't be an issue, except I've vowed not to do anything until my army is painted, so the pile grows. 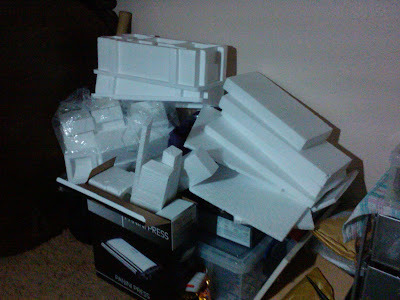 The big question is do I stop collecting the polystyrene and potentially piece of on some free goodness, or do I buy boxes and start stacking them in the corner in the hope I forget I'm doing it, and won't feel so guilty? I have been looking over ebay the last few weeks to see if I can get myself some bargains, as we all know how expensive this hobby can get, especially if you're starting up. 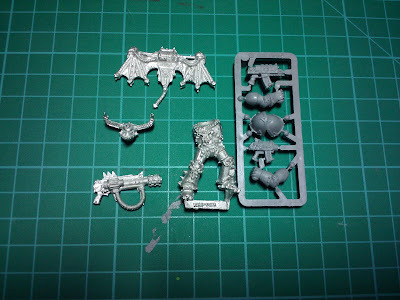 The main aim was to find a greater daemon for less than £25, which I did but forgot to bid.. so yeah. 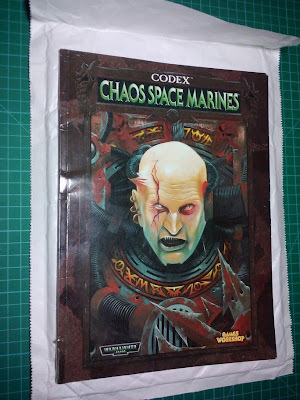 Anyway, I was having a browse through the chaos section when I came across a few items of interest; the first of which being a 3rd edition Chaos Space Marine Codex. I just had to dip my finger into the Paypal wallet, pull out a few coppers to then click on the 'Buy Now' button. Awesome, I now have an old codex to browse through. It so happens I got home today and found it neatly sealed in a jiffy bag. After an initial look I realise that it's nowhere near as in depth as recent releases, but still worth a good old read. Now, onto the second item of interest; this one being my favourite of the two. Being a new player I haven't be privy to the advancement of the game, rules (which is a good thing as I don't suffer from MRS likes some of you old fart :-D) and especially miniatures. I've always had a thing for jump packs and flying creatures, I guess one could say it's the feeling or imagination of feeling the freedom of the air. 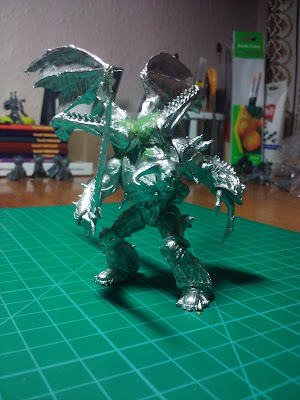 The model is of course a Chaos Space Marine Raptor, and from what I can make out it was in production in the late 90's... possibly 1998. Not sure what edition that was, but I'm sure if I stopped being lazy I could find out. I'm not sure about you guys but I personally love it, especially the helm and it's interesting to look at the model and see how the raptors have advanced in looks. I'm more of a fan aesthetically wise to the newer model of raptors, however, I appreciate where it came from, and there it is. Something old for you, and something new for me, good all round I say! I have never stood on a battlefield, hot air from the engines of behemoth tanks propelled towards my unprotected face. With the sounds of gunfire skimming just over my head and explosions that devastate all that is within its path. Anthony Reynolds the author of Dark Apostle has done a fine job of bringing me to such a place from the comfort of my arm chair. This book is a fine example of good versus evil, where the damned seem to have an unrelenting thirst for blood and corruption, never letting their foe rest. At no point during this epic adventure did I find myself getting tired of bored, I ever more wanted to turn the page and find out what was on the horizon for the characters followed. Of all the characters within the book, I found myself sympathising with Varnus the most, his epic struggle with what was unfolding and how the torment was never ending; we all suffer from this at some point. While moving from one quest to another I could feel myself being pulled from one force to the other in who I wished to succeed, everyone seemed a hero while reading it and any of the armies was worthy of triumph. When taking away the story of the book I found the writing to flow freely and at no point did I find myself struggle to carry on, which is all credit to the author. The battle scene descriptions were amazing, especially with the Dreadnought Warmonger and his comrades, which gave a new insight into how we look at them outside of the codex. 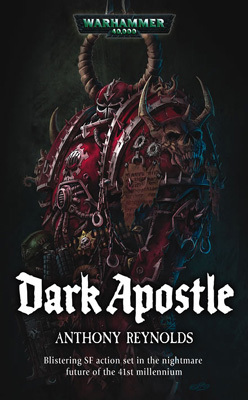 The only area of the book I’d liked to have seen expanded is possibly Word Bearers background and more of an insight into the legion itself, however I am aware there are others books and that these may do so. To anyone reading this review and wondering if you should get it, or if you’ve been undecided about getting the novel, then I’d say go for it. I thoroughly enjoyed the read and will be picking up the other two in the series as soon as I’ve finished the next book of the ‘heresy’ series Fulgrim (for me anyway as I’m a late starter on them). Anthony Reynolds is a fine author and is up there with Dan Abnett and Graham McNeill in regards to Warhammmer 40k novels. I started painting today, out came my Vallejo Game Colour paints (love the dropper bottles); the first of which was the black for base coating. When I started I thought it a bit strange that the first two Khorne Berzerkers I base coated were slightly shiny, and I'm not talking primer shine, I'm almost considering Citadel brush on undercoat. However, after those first two they came out all nice and matt, I think there may have been some unshaken paint in the nozzle of the bottle and that could have caused the issue, either way it's all fine now. I've had an issue with the models on their bases, I didn't pin the models into the bases and cork, and as a result two came loose, so I've pinned them now and they seem more stable than they did, I'll do the others as and when needed, Dunc at the club can help with that one. Haha. 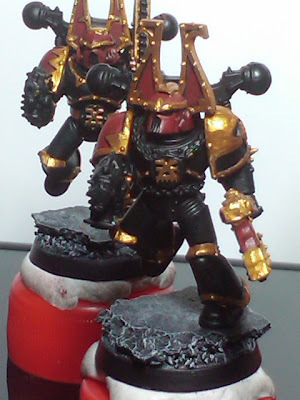 Anyway, to the point, I've decided I don't like metallics paints. I painted a practice model along with the base coating of the berzerkers; this is just standard bolter guy in the Black legion colours. As you can imagine it was mostly painted in golds and silver like metallics, and I really don't like it. 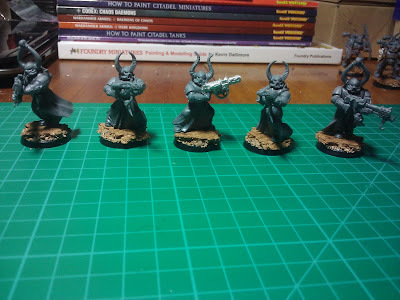 Even with the gold highlighted with a bit of mithril they look so meh. The more I've been looking at guides on painting and colour and the like the more I've moved away from the realism miniatures, the one that look as if they could be a real person or object, and the more I've moved towards Kevin Dallimore style of painting, more cartoonified and colourful. Models in my opinion are now painted in to dark a scheme, I know this is whats going to win you a Golden Daemon, but I don't care, I want vibrancy! 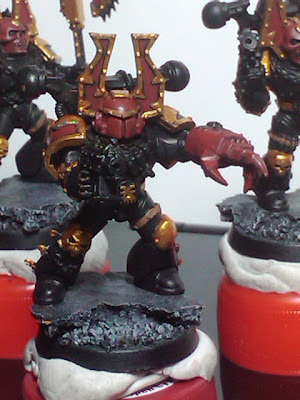 So, with this in mind I'm going to paint the Black Legion is black and yellow with either highlights of a lighter yellow or white. I haven't decided how I'm completley going to do it, but I'll try and come up with a decision by the end of the week. Anyone out there happen to have any tips on yellow? Today things didn't go as planned, and thus I am at home with a high temperature, aching ribs, a bad back and a headache. With no will in the world to do much constructive beside eat tomato soup and soldiers I decided to have a gander on the Internet with regards to my beloved Chaos. While having a look around I came across an amazing retro computer game design for Windows 95 by the name of 'Chaos Gate'. Personally I've never heard of it, but the cover to the game caught my eye, and one particular bit.. the glowing green chain-sword. I think you'll all agree that the art work is beautiful, especially the fact those pesky Ultramarines are getting the righteous, self worth arses kicked. The the chain-sword rocks. I've decided I'd possibly like to have a similar style chain-sword on my Aspiring Champions and the like, or whole squads with chain weapons. My question to you all, is how do you think I'd paint a similar style weapon. I realise that unless I use glow in the dark paint it's not going to glow, but I'd still like the vibrancy of the weapon. Any tips, hints or links would be greatly appreciated. I haven't made a post in a while, there are a number of reasons why, but unfortunately the biggest one being procrastination. 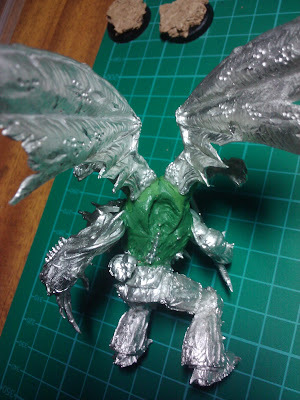 I have made a bit of progress with the army, the chosen are built, I've started the priming of the units and the Daemon Prince has wings. Not much considering I've had 2 weeks or so of not posting, but after 12 hours shifts and finishing at 9pm I can't really be arsed if truth be know. I have plenty if ideas and hopes, but work does at times get your hobby mood down. Anyway, here are a few picture of the army in it's present state, bar the Rhino's. 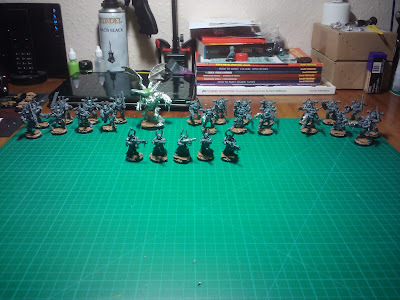 As of Thursday I have nearly 10 days off due to having a minor day operation, so hopefully I'll be able to get a good chunk of the army painted in that time as I won't have much else to do at home. 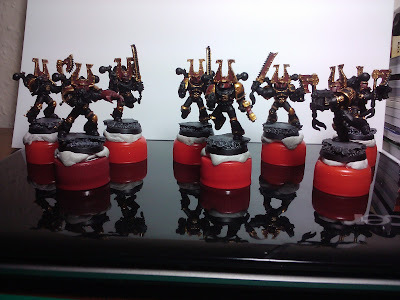 Only models left to build are the obliterators, which I plan to make from Chaos terminators, with one arm using the possessed marines mutated arms as powerfist stand ins, and all the other left over guns.